The Miller Lab group is part of the Department of Biology at Saint Louis University and the Donald Danforth Plant Science Center. Members of our group have a range of interests and expertise related to plant evolutionary biology, including bioinformatics, ethnobotany, evolutionary ecology, field botany, genetics, genomics, morphology, phylogeny reconstruction, pollination biology, and statistics, among much else. We are very fortunate to work with a diversity of scientists on ongoing projects. Our current collaborators are based at the Danforth Plant Science Center, E. & J. Gallo Winery, The Land Institute, the Missouri Botanical Garden, Missouri State University, South Dakota State University, the University of Missouri, the US Botanic Garden, and the US Department of Agriculture. 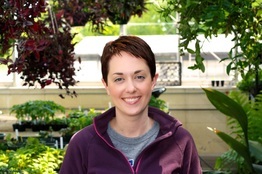 Allison is a Professor in the Department of Biology at Saint Louis University (faculty website) and a Member and Principal Investigator at the Danforth Plant Science Center (investigator website). She is also a Research Associate at the Missouri Botanical Garden. She is obsessed with plants and has been chasing down crops and their wild relatives for the better part of 15 years. Her research program focuses on evolutionary processes in contemporary and emerging perennial crops and their wild relatives. Ongoing work in her group includes grapevines, perennial, herbaceous legumes, and various fruit and nut trees. By understanding evolutionary processes in crop species and their ancestors, she hopes to contribute to the conservation of crop genetic resources, crop improvement, and sustainable agriculture. Originally from the Chicago area, Allison became interested in plants through trips to nearby prairie patches and summer vacations in northern Wisconsin. She holds a BS degree in Botany from Miami University and an MS degree in Botany from Colorado State University. She earned a PhD in Ecology, Evolution, and Population Biology from Washington University in St. Louis in a joint program with the Missouri Botanical Garden. When she's not working on plants, Allison can be found hanging around with her family. For more information on course that Allison teaches at SLU, please click here. Wesley is a Junior at Harris-Stowe State University, majoring in Biology. After becoming a McNair Scholar through Saint Louis University he was given Allison Miller as a mentor and placed within our lab. He was first introduced to plant science during an internship last summer (2017) through the Missouri & New York Botanical Gardens working under Gregory Plunkett & Pete Lowry. He then conducted phylogenetic research under David Bogler on the plant genus Thalia. Next he plans on attending graduate school to study Genomics. Wesley also considers himself a die-hard Los Angeles Lakers & Rams fan." Niyati is a third year student at SLU pursuing a B.S in Biology and Mathematics. She chose to study these subjects because she enjoys learning about science and problem solving. She works in the Biology department as a teaching assistant for intro biology lab. In her free time she volunteers with Campus Kitchen and Almost Home. Her hobbies include reading, hiking, and spending time with her friends. Niyati heard of this opportunity from Dr. Miller while taking her evolution course. Mary brings a unique perspective to Danforth Center both personally and professionally with over 20 years serving in administrative roles for academic research at Saint Louis University and Washington University in St. Louis. She coordinates Danforth Center’s Weekly Scientific Seminars and serves as an admin for Topp and Kellogg labs in addition to Miller. She’s also a fan of her team members, empathy, humor, travel, goats, music and super heroes. Emma is a graduate from Bucknell University with a B.A. in Environmental Studies and a minor in Spanish. At Bucknell she worked with Dr. Chris Martine in phylogenetics and systematics of Australian Solanums. She was involved with the identification of two new species of Solanum, in addition to an ecological niche-modeling project for four Solanum species complexes. Through her major, she became fascinated by the relationship between climate change and food systems, and the ways in which environmental issues can be solved through food systems, rather than worsened by them. Her honors thesis was about veganism and food culture. She is excited to be combining her interests in sustainable agriculture with botanical research in the Miller Lab. She is a cat lover and crossword enthusiast. Zach completed his undergraduate career as a double major in environmental chemistry and general biology at Missouri State University. As an undergrad, he worked for a short time in a computational chemistry lab under the guidance of Dr. Matthew Siebert. His developed interest in computation coupled with an interest in biology led him to complete an MS in Biology at Missouri State under the guidance of Dr. Laszlo Kovacs. 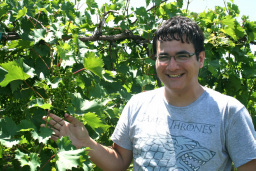 In the Kovacs lab, he worked on genome annotation, transcriptome profiling, and long non-coding RNA identification in grapevine. Toward the end of his tenure, he began working on the functional implications of RNA structure and function on resolving phylogentic relationships. He hopes to continue this work as a doctoral student while simultaneously determining the transcriptomic implications of rootstock selection. In his free time, he enjoys lab-unrelated big data explorations, Netflix, podcasts, and other inside activities. Sterling was first drawn to plants through Native American ethnobotany of the southeastern Appalachians, starting a small business crafting jewelweed (anti-poison ivy) soap and lotion. He engaged in two REU programs during the summers of 2013 and 2014, studying human blood zymogens and the hybrid origin of the Concord grape cultivar (work with Jun Wen). After receiving a B.S. in biology and chemistry from Milligan College in 2015, he joined the Miller lab and began work on the perennial agriculture project, a collaboration among SLU, The Land Institute (Salina, KS), and the Missouri Botanical Garden (St Louis, MO), focusing on the legume family, Fabaceae. The central focus of his dissertation is to determine fundamental differences among congeneric herbaceous annuals and perennials in terms of germination, growth rate, reproductive allocation, and root allocation / architecture. When not staring at legumes, you can find him enjoying hiking, spelunking, photography, biomimicry, dogs, H.P. Lovecraft, and watching sunsets. Laura started her botanical career in undergrad at the University of Wisconsin - Oshkosh, where she spent two months at the Missouri Botanical garden measuring and and describing herbarium specimens for the Campanulaceae treatment in the Flora of China. After finishing her B.S. in 2010, she moved to southwest Ohio to get her M.S. at Miami University. There, Laura spent two glorious years in Miami's historic herbarium, surrounded by pickled fern specimens, studying morphology and introgressive hybridization between three species of North American Diphasiastrum (Lycopodiaceae). 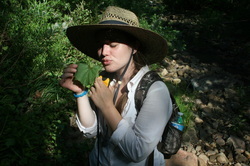 In 2012, she joined the Miller lab to study hybridization, evolutionary genomics, and morphology in North American Vitis (even though she still loves ferns). Other than plants, Laura enjoys biking, sampling various restaurants in St Louis, playing board games, and sitting on her balcony with a book. Update: Laura successfully defended her dissertation and started as a postdoc in the lab working on the grape project. Congratulations, Laura!! Alex recently finished his undergraduate degree at Missouri State University, where he worked in the lab of Dr. Laszlo Kovacs. During his Doctoral degree program at SLU, Alex will be co-advised by Christy Edwards (Conservation Geneticist, Missouri Botanical Garden) and Allison. Alex's project will focus on conservation genetics of the ebony/persimmon genus (Diospyros) in the Mascarenes. Lisa is a fourth year student at Saint Louis University pursuing a BA in Biology. She has always wanted to help people, and studying Biology has given her the opportunity to do that in so many ways! During the school year, she works as both a Medical Scribe and a teaching assistant for the Physics department. When she isn't spending her time studying, working, or researching, you can catch Lisa singing with her acappella group, walking her two dogs, or enjoying the great outdoors. 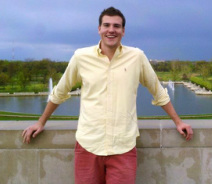 Colton is a second year student at SLU working towards a B.S. in Biology as well as minors in Public Health and Spanish (he enjoys being one of the few students at SLU majoring in biology without being pre-med or pre-anything for that matter). Colton is a member of the University Honors Program as well as the SLU Cross Country and Track Team and when he is not studying, running, eating, or sleeping, he likes to spend time volunteering with StudentsCare and Restore St. Louis. He has always held a fond place in his heart for nature, the outdoors, and plants which led him to take the Spring Flora field course at the SLU Reis Biological Station in the Summer of 2016. This passion also led him to this lab which he is very excited to be apart of. Colton is working on the Perennial Agriculture Project Global Inventory. Matthew joined the Miller Lab group in early January as a Postdoctoral Associate. He is broadly interested in genetic mechanisms of adaptation to heterogeneous environments, and plasticity in trait expression across environmental regimes. His research takes a holistic approach to understand the abiotic environmental factors that influence trait expression, the developmental mechanisms that perceive and integrate these environmental signals at the whole organism level, and the amount of phenotypic variation and plasticity present for a given trait. He competed his B.S. and M.S. degrees at the University of Wisconsin-Oshkosh where his research focused on the role of season cues on germination timing in the model plant,Arabidopsis thaliana.Matthew completed his Ph.D. at the University of Wyoming focusing on examining quantitative variation in the circadian clock in plants grown under natural field conditions and the role of the circadian clock in regulating plant architecture. Most recently, Matthew was a Postdoctoral Associate at Syracuse University. He is excited to join the Miller Lab and work on projects relating to perennial agriculture! Coming from a small rural town in central Missouri, as the middle child of six, I never imagined science could be a career, let alone research. It wasn't until I found myself in a chemistry course at State Fair Community College that this changed. I conducted an independent research project testing the effect of different root hormone concentrations on the success of tissue culturing using my very own Venus flytraps (Dionaea muscipula). This project allowed me to turn a passion for growing plants into a love of plant science. Continuing on with my academic career I attended the University of Central Missouri (UCM) pursuing a BS in Biology, taking many chemistry and genetics courses along the way. In the summer of 2014 I was an intern in the REU program at the Missouri Botanical Garden (MOBOT) working with Dr. Christine Edwards. I investigated the mating system of Polygala lewtonii (Polygalaceae), a federally endangered species endemic to the yellow sand scrub of central Florida, using population genetics at both range-wide and fine scales (~0.25km2). After graduating from UCM, I joined the Edwards lab at MOBOT as a lab technician working on all manner of things from Brassicaceae to bats in topics including DNA metabarcoding, population and conservation genetics, and biogeography. I will be joining the Miller lab, funded by a NSF Graduate Research Fellowship, to work on understanding the ability of rootstock’s to modulate the phenotype of the scion across differing climates. Other hobbies and interest include building/breaking/exploring single-board and regular computers, reading for fun, listening to audio books/podcasts/etc, growing carnivorous plants, cooking, and disc golf. Brigette completed her B.S. in General Biology at Drury University and her M.S. in Plant Science at Missouri State University. During undergrad, she identified equal interest in plants and genetics, and then combined the two in her M.S. thesis research exploring the genetics of leaf shape morphology in grapes. She also has a life long interest in conservation and is a member of the Missouri Master Naturalists. She comes to SLU and the Missouri Botanical Garden to pursue a PhD in Plant Conservation Genetics as the 2016 Needleman Fellow. She will be co-advised by Dr. Allison Miller at SLU and Dr. Christine Edwards at Missouri Botanical Garden. Brigette is very excited to join both labs and hopes to use a novel approach to research the genetics of plasticity in a species of conservation concern. In her free time she enjoys being active outdoors, especially hiking, floating, and camping with her dogs. Henry and Lily, Junior Research Assistants. Claudia Ciotir finished her PhD degree at Trent University, Canada where she worked in the lab of Dr. Joanna Freeland. Her work unraveled historical and contemporary processes that shaped genetic structure of disjunct and invasive plant species populations around the Great Lakes regions. Her research has shown that comparisons of regional and global phylogeographic patterns can provide useful insights for management decisions in conservation biology and invasive species. Previously, Claudia completed her MSc in Plant Diversity Taxonomy and Evolution at The University of Reading, UK under the supervision of Dr. Alastair Culham, and completed her thesis on phylogeny and DNA barcoding of wild Cyclamen species. She also worked as research botanist for the Romanian Genebank where she was in charge of cataloguing crop wild relatives and documenting their regional in-situ and ex-situ conservation. 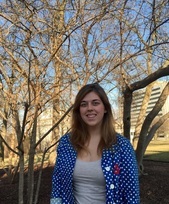 ​Claudia joined the Miller Lab in December 2015 and is working in the Perennial Agriculture Project, a collaborative partnership between The Land Institute, Saint Louis University, and the Missouri Botanical Garden. She is using a combination of literature, field experiments and genomic screening to develop a global large scale inventory of crop perennial legumes and to evaluate valuable traits that will allow the inclusion of potential candidate species in pre-breeding and domestication programs. As a master's student in Saint Louis University's Nutrition and Dietetics program, Heather is on a quest to build a career that addresses rising health crises through a food system that heals injustices, both social and environmental. With advisor, Dr. Katie Eliot (Nutrition and Dietetics) and guidance from Dr. Allison Miller, Heather is focusing her thesis research on nutritive values and sensory qualities of perennial crops, namely legumes. She is excited to join the lab where she can develop interprofessional skills and collaborate with some groovy folk. Prior to joining the graduate program Heather completed her undergraduate degrees at Baldwin Wallace University, followed by one year of volunteer service with AmeriCorps National Civilian Community Corps. During her corps year she worked on projects addressing environmental restoration and injustices and wild fire mitigation in the pacific region of the US. Outside of her academics, Heather can be found riding her bike, backpacking, vegetable gardening, fantasizing of bougie wines and compromising with her insatiable dog, Conway. Laura Klein, PhD Biology (SLU 2017). See above - Laura is currently a postdoc in the lab! Steven Callen, PhD Biology (SLU 2016). Current position: Postdoctoral research associate at the Danforth Plant Science Center working in Malia Gehan's group. Chrissy McAllister, PhD Biology (SLU 2014). Natural Resources at Principia College in Elsah, Illinois, teaching a wide range of botany-related courses. Her Master’s research at Kansas State University focused on plant ecophysiology—understanding how plants respond to the abiotic environment. Her doctoral research focused on plant population genetics, with a particular focus on exploring how past and current climate impacts population genetic structure in tallgrass prairie plants. She really enjoys working in undergraduate education, and she is excited about helping to increase undergraduate research opportunities both at St. Louis University and at Principia College. Carolina Romero-Hernandez, MS Biology (SLU 2011). Carolina is one of the world's experts on the species rich genus of legumes, Inga. 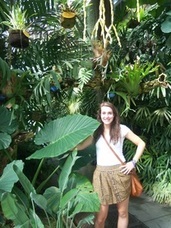 She is currently working at the Missouri Botanical Garden. ​Current position: Research Specialist, Missouri Botanical Garden Research Division. Danielle Sampliner, MS Biology (SLU 2009). Danielle conducted ethnobotanical, phylogenetic, and phylogeographic studies in the horseradish genus (Armoracia) for her Master's degree. Danielle is currently working at the Cleveland Museum of Natural History. Current position: Biology teacher, Highland High School, Cleveland, OH..
Aidan Leckie-Harre, Undergraduate Researcher (2018). ﻿Emily Boeckenstedt, Undergraduate Researcher (2018). Emily is a rising senior at Saint Louis University working towards a major in Health Sciences and a minor in Biology. She has been passionate about plant science and evolution for as long as she can remember, despite her intent to enter a medical profession. When she's not in the lab, you can find her working as a waitress at Flannery's Pub in downtown STL, or as a medical scribe at Barnes Jewish hospital. Despite what they tell you, working in a plant science lab does not give you a green thumb, so it is also likely you can find her at Home Depot replacing even the lowest-of-maintenance plants. Brittany Pace, Undergraduate Researcher (2018). My name is Brittany Pace, and I am a Junior majoring in Biology and Forensic Science. Growing up, gardening with my family was a summer tradition, which inspired my love of plants. I enjoy working in the Miller lab because it allows me to do both lab and field work. I am excited to be able to work with plants in new and interesting ways and learn more about plant biology! In my spare time I enjoy reading, hiking, collecting mugs, and cheering on my own houseplants. Christian Kingeter, Erin Knight, and Danielle Hopkins, SLU Undergraduate Researchers (2018). Team Grape Leaf has been busy scanning in grapevine leaves collected by Ph.D Candidate Laura Klein and have signed up for another exciting semester of placing landmarks on the leaves. Laura's dissertation research focuses on using digital leaf morphometrics and population genetics to understand interspecific gene flow in natural populations of native grapevines. Portions of this work has been funded by the National Geographic Society, National Science Foundation, and the Saint Louis University Presidential Research Fund. Update: Christian Kingeter graduated in Spring 2017. Congratulations, Christian! Emma is an upcoming 4th year student at Oberlin College, set to graduate with a major in Biology and a minor in Geology. She is especially interested in plant evolution. Originally from the Boston area, Emma loves backpacking, spending time with her dog, and baking (especially things with chocolate). As a summer 2017 REU intern she will be working on the Perennial Agriculture Project Global Inventory. Madeleine Caito, Undergraduate Researcher (SLU Biology and Psychology 2015). Madeleine, a native of St. Louis. After graduation, Madeleine plans to attend medical school and to continue working in a research setting. Madeleine is very excited to join the Miller research team and will be working on the Mount Vernon project, aiming to identify the role of the rootstock on a grapevine’s phenotypic plasticity. Her love for plants stems from her childhood memories gardening with her grandmother, and her interest in grapevines in particular derives from her years spent living in the South of France. In Madeleine’s free time she adores traveling, cooking, playing the piano, and carrying on her grandmother’s passion by working in her personal garden. Steve Chacko, Undergraduate researcher (SLU Biology and Music 2014). Steve worked in the lab during the last semester of his senior year at SLU. He is originally from the northwest suburbs of Chicago. He will most likely be attending Creighton University School of Medicine in the fall. His hobbies include playing guitar and piano. Steve was a member of Team Landmark within the Miller Lab, placing landmarks on a variety of leaves from the Vitis genus to understand morphological relationships between a variety of species. This was a collaborative project with Dan Chitwood at the Danforth Plant Science Center. Chad Chapnick, Undergraduate researchers (SLU 2018) Chad is pursuing a major in Biomedical Engineering at Saint Louis University. He strives to help others working on projects that positively impact society. Above all, he believes in the power of learning and understanding in order to adapt to a rapidly changing world. Some of his interests include cosmology, sustainable agriculture and energy production, and ecological science. Chad spends his free time meeting new people and experiencing the vibrant culture his city has to offer. Matthew Greg, Undergraduate Researcher (SLU Biology, History, Theology 2015). Matthew is from the southwest suburbs of Chicago, IL. He grew to love plants by being an Eagle Scout and a landscaper around his community. Matthew's interests in terms of botany include invasive species, particularly kudzu, and grapevines (Vitis species). He enjoys learning about the ecological impacts and economic importance of staple agricultural crops, as well as ethnobotany. Matthew is willing to learn anything and everything that comes his way, a true characteristic of a life-long learner and teacher, which he aspires to become one day. UPDATE: Matthew started an M. Div. program at Duke University in Fall 2015 - congratulations, Matthew! Cassandra Kitchen, Undergraduate researcher (SLU 2015). Cassandra is a senior at SLU majoring in Biology and minoring in Conservation and Biodiversity; she participated in the NSF Research Experiences for Undergraduates program (REU) program at the Missouri Botanical Garden in Summer 2014. She is interested in economically important plants, especially those which are dietary staples, and how they relate to their environments. She quantified Vitis morphological diversity in Dr. Miller’s lab. After graduation, she would like to continue working with plants, possibly in a greenhouse setting. Cassandra grew up in the St. Louis area. While she has a great love for any time she spends interacting with plants in nature or in her small garden, Cassandra also enjoys spending her time relaxing with a book or exploring the urban landscape with friends. Dahlia Martinez, Undergraduate researcher, Missouri Botanical Garden NSF REU program. Dahlia is a senior at Holy Names University in Oakland, California where she is studying Biology. She came to St. Louis to participate in the 2016 Missouri Botanical Garden's NSF-funded Research Experiences for Undergraduates (REU) program. For her REU project, Dahlia worked with our group on the Global Inventory of Perennial Grains, Legumes, and Oilseed species in collaboration with The Land Institute. Early in the summer Dahlia and Allison traveled to Salina where Dahlia learned about the incredible Asteraceae genus Silphium during a special meeting/workshop of Silphium researchers. Dahlia worked with the Missouri Botanical Garden's herbarium collection of Silphium, as well as wild populations near St. Louis, to understand the relationship between seed production and vegetative characteristics in wild Silphium species. UPDATE: Dahlia graduated from Holy Names University in ay 2017. She joined E. & J. Gallo Winery as an intern in summer 2017. She recently accepted a job as an Assistant Plant Breeder with PanAmerican Seed. ﻿Regan O'Hanlon, Research Assistant (SLU 2015). Regan graduated from SLU with a BS degree in Biology in May 2015, and has generously agreed to stay on for the summer to continue her outstanding work with native grapevine leaf morphometrics and population genetics. Originally from the Quad Cities, Regan has been landmarking grapevine leaves in the since last summer. She has processed thousands of images and has contributed significantly to ongoing projects characterizing variation in leaf shape within Vitis. UPDATE: Regan joined Food Corps in Iowa. Congratulations, Regan! Brooke is a senior at SLU studying Biology with a concentration in Plant Sciences and Anthropology. She is originally from Jefferson City but spent some time living in Lima, Peru. She has always loved plants but her interest in ethnobotany stems from her exposure to traditional medicine while in Peru. 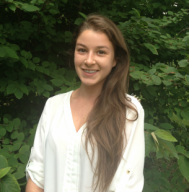 After graduating, Brooke hopes to continue her education by studying ethnobotany and medicinal uses of plants. Brooke helped the lab launch a new project conducting a global inventory of wild perennial grain and legume species that might be suitable for domestication. ﻿﻿Then, she went to London for a semester where she worked with Sandy Knapp studying the ethnobotany of wild African Solanums at the Natural History Museum of London. Brooke recently returned to SLU as a junior where is going to continue both her Solanum work and her contributions to the global inventory project. 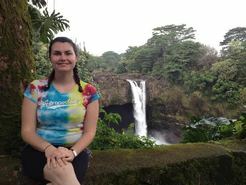 Update: Brooke graduated from SLU in 2017 and completed Master's program in Ethnobotany at the University of Edinburgh. She will begin a PhD program in Sweden in 2019. Congratulations, Brooke! Daniel Pap, Visiting Researcher (Missouri State University). Daniel is finishing up his Master's degree at Missouri State University under the direction of Laszlo Kovacs. He is visiting St. Louis (June 2013) to work on population genetics analyses of microsatellite and GBS data for Vitis rupestris and related species. Daniel is currently enrolled in a PhD program with Andy Walker at UC Davis. Paige graduated from SLU in 2018 with a B.A. in Biology along with a Theology Major. She is from St. Louis and she loves biology; from plants to animals. She is involved in XA (Christian Group) and Women’s Club Lacrosse. She works at the Saint Louis Zoo as a behavioral research intern studying the behaviors of different animals such as the polar bear, gorillas, and giraffes. Outside of her life at SLU and the zoo, she enjoys activities like working out, hiking, and spending quality time with friends. Her passion for Biology allowed her to pursue this great lab opportunity. Paige will be working on the Perennial Agriculture Project. Paige is also the best lab selfie taker ever. UPDATE: Paige is working as a Biologist at Bayer. Congratulations, Paige! Chelsea Pretz, Undergraduate researcher (Harris Stowe State University, 2015). Chelsea has a deep interest in plant biology and simply just enjoys being outside. She participated in the NSF Research Experiences for Undergraduates (REU) program at the Missouri Botanical Garden, summer 2014. During that time she was able to explore the ecology of prairies. Chelsea is an undergraduate at Harris-Stowe State University. She grew up in St. Louis and is excited to do research in the community she loves. In the Miller Lab, Chelsea is working on a project involving the use of genetic data to understand interspecific hybridization in native grapevines. 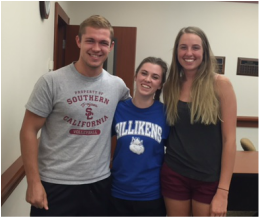 For the summer of 2015, Chelsea is participating in the NSF Research Experiences for Undergraduates (REU) program at the Danforth Plant Science Center. In her free time you can find Chelsea biking, cooking, traveling, volunteering or tending to her garden. UPDATE: Chelsea was awarded an NSF Graduate Research Fellowship! She is current a PhD student at the University of Colorado. Alexandra Rader, SLU Undergraduate Researcher (2018). Alexandra is a senior at Saint Louis University pursuing a BA in biology and music. She fell in love with biology, but she didn’t want to stop studying the flute, which she has played for eleven years. So, she decided to major in both! Alex has assisted in research in nearly every facet of biology, from the genetics of miscanthus grass, to the ecology of bee populations, to molecular biology using fruit flies, but found that she most enjoyed working with and researching plants. She currently volunteers with an organization called Pop Up Prairie, tending to micro-prairies in public parks across St. Louis. When she’s not in a lab, Alex enjoys experimenting with makeup, performing stand up and improv comedy, drinking local beer, and spoiling her two cats, Marlow and Phenylalanine. Marissa is an undergraduate at the University of California, Berkeley. She's majoring in biology, with an emphasis in biodiversity, and minoring in Spanish. As an intern for the summer of 2018, Marissa will be working on the Perennial Agriculture Project. She enjoys coffee, sunshine, telenovelas, podcasts, and natural history museums. Shaun Sarmiento, Undergraduate researcher (SLU Biology 2013). Shaun headed up the horseradish project. He made crosses, amplified SI loci, prepped samples for genotyping by sequencing, and analyzed data. Currently Shaun is teaching in the Jesuit College Preparatory College of Dallas. Samantha Selby, Undergraduate researcher (SLU 2016). Samantha majored in Biology and minored in Public Health and was a member of the University Honors Program. Sam has done a lot of cool things as an undergraduate at SLU including completing a semester of courses at the Saint Louis University Reis Biological Field Station, working as an intern in the Botanical Society of America's Planting Science Program, and most recently as an undergraduate researcher on the Global Inventory of Perennial Grains, Legumes, and Oilseed species. As part of this project, in the summer of 2016 Sam is based at the Missouri Botanical Garden working to gather information on wild members of the genus Vigna (Fabaceae). Using Vigna as a model, she is testing hypotheses about how wild, congeneric annuals and perennial species allocate resources sexual reproduction vs. vegetative growth. UPDATE: Sam joined the Peace Corps! Summer is a learner at heart with an insatiable curiosity and a passion for science with integrity. Her personal mission is to synthesize traditional ecological knowledge with modern scientific understanding to forge a new paradigm of ecocentric living. ​Summer spent some time at the University of Arkansas where she discovered a love for plants and pursued a major in Horticulture before she transferred to the University of North Texas to complete a B.S. in Geography. Her specific research interests are in sustainable and urban agriculture systems, agroecology, and the ethnobotany & flora of the Ozarks bioregion. She is working under the mentorship of ethnobiologist Dr. Steve Wolverton and biogeographer Dr. Lisa Nagaoka to complete an undergraduate thesis for the McNair Scholars Program, evaluating the UNT campus' landscape plants for their ecological and ornamental services. In Dr. Miller's lab, she is working on the Perennial Agriculture Project Global Inventory as a participant in the National Science Foundation Research Experience for Undergraduates program at the Missouri Botanical Gardens. Previously, she has worked as the City Horticulturist for the City of Eureka Springs (AR), as the resident native plant specialist in an Ozark nursery, and as a Sustainability Intern for the University of Arkansas, a regional solid waste management company, and a California-based environmental non-profit. She spends her off hours foraging and wildcrafting, drinking all different kinds of tea, and working for an organic urban farm in St. Louis. Jake Timmer, Undergraduate researcher (SLU Biology 2013). Jake worked closely with Shaun Sarmiento on the horseradish project. He stayed busy extracting DNA, amplifying putative S alleles, and conducting pollination experiments. UPDATE: Jake is in a Master's of Science degree program in Finance at Southern Methodist University. Congratulations, Jake! Olivia Weigl, Undergraduate Researcher (2018). Olivia graduated from SLU in 2018 with majors in biology and international studies major with a minor in Spanish. She chose these studies because of her love of science and cultural diversity. She is involved in APO (the service fraternity), ZTA (social sorority), Oriflamme, and transfer mentors. In her spare time she works out and hangs out with friends. She was born and raised in south county St. Louis. Olivia transferred from Loyola University Chicago her sophomore year and found herself at the National University of Galway last fall where she was fortunate enough to travel around Europe. Olivia attended the Reis station last summer where she first heard of this opportunity. UPDATE: Olivia is working for Teach for America - congratulations Olivia! Vickie Williams, Visiting Undergraduate Researcher. Vickie is heading into her junior year at Davidson College. She is majoring in Biology and History. Tracy Zander, Undergraduate researcher (SLU Public Health 2013). Tracy hails from Geneva, Illinois. As an undergraduate at SLU, she contributed to several projects including Geocarpon, horseradish, kudzu, and grape. Tracy graduated in 2013 and is now pursuing a Master's of Public Health at SLU. Although her dream career is to be a neo-natologist, she is fascinated by just about everything that plants do and plans to always be involved in botany to some degree! She has greatly enjoyed helping with the molecular work of Geocarpon, horseradish, Vitis, and kudzu (for which she also assisted with a pollination study), but she will always be captivated by the glandular trichomes of the carnivorous Drosera (sundew), and by the brilliantly evolved Ophrys (bee orchid). Aside from plants, she also greatly enjoys running, white water kayaking, and playing the cello. UPDATE: Tracy completed the Master's degree in Public Health at Saint Louis University and is currently working in the Nashville area. Congratulations, Tracy! Daniela Rey Ardila; Fall 2010. Tracey Bertram, SLU BA Biology 2009 (in lab 2007 – ‘09); currently med student at Saint Louis Univ.